Har ki Dun, located below Fateh Parvat in the midst of the U shaped vale, is undoubtedly the most gorgeous valleys in North India. One can reach to the valley through trek via Govind National Park. “Valley of the Gods” is the term popularly associated with the valley. Moreover, a brilliant contrast of alpine meadow, moraine ridges, glacier basins, and soaring peaks all around, create one of the natural canvases that captures the heart and mind of the trekkers. In the 1940’s, Jack Gibson, who was a School teacher at Doon School, fell in love with the valley and popularized it in the world. He also used to encourage his students to take regulars treks at high grounds of Har ki Dun. Moreover, the curiosity of Jack Gibson has accredited him with the title of the godfather of Indian Mountaineering. The successful summit in 1951 to Mt. Trishul also inspired Indian mountaineers such as Cheema and Jagjeet Singh. 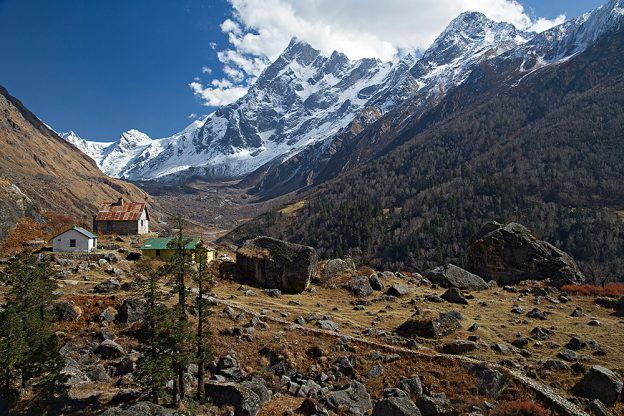 Along with professionals and avid travelers, this trek is also popular amidst school children. Early summer every year is the time, one can find big group of school students enjoying the Har ki Dun Trek. • Altitude: 3556 m, Harkidun campsite. • Trail Type & Difficulty: Easy Medium slopes, steep incline trek going through Govind National Park. Forest cover and meadows till Harkidun camp. To Osla from Seema expect a rocky terrain. Ideal for trekking newbies. • Railhead: Dehradun (190 km) is close to Sankri. • Roadhead: From Delhi (440 km) there are buses available from Anand Vihar ISBT. Alternatively, one can hire a cab from Delhi to Dehradun. • Base Camp: Sankri, reach by bus/car from Delhi. ‘Parwarti’ is the term used for local villagers of the Har Ki Dun Valley. The villagers claim to be the decedents of the “Kauravas”, the Mahabharata clan. Similarly, the custom of the village is also unique. This is one of the rarest communities that idolize “Duryodhana”. 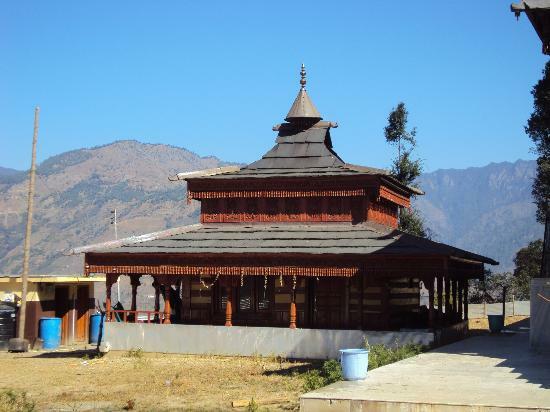 There are various temples in Osla Village that are devoted to Duryodhana. There also is a weeklong celebration organized in which a one-legged Duryodhana idol is taken around the villages in an organized demonstration. “Pokhu”, a sheep god is also revered by the locals as the community is engaged into managing of sheep and livestock. The locals are superstitious and orthodox. They also believe in polyandry. Houses with the unique wooden architecture also win the heart of the visitors. The red colored Ramdana fields also compliment the ambience of the valley and village. The Swargarohini I Peak is also regarded of great significance as the Pandava brothers climbed this peak to enter heaven. • Getting To/From: Harkidun Trek can be attempted from Sankri. To reach Sankri, it takes 8 – 10 hours from Dehradun. • Porters & Guides: Guides and Porters can be hired from Uttarkashi or Dehradoon. Ponies are not allowed. • Weather Conditions: Campsite at night may experience temperature dipping to 5 °C to 0 °C. Temperature during the day time remains pleasant. Har Ki Dun is covered by snow through most part of the year. Thus, the best time to opt the trek is between March and June (Day: 14-22 °C, Night: 0-8 °C) or September and Nov (Day: 12-20 °C, Night: -2 to 8 °C). During these months of the year, the route is not covered by snow, and is easy for the adventure enthusiasts to enjoy their trek. Moreover, the surrounding also showcases some of the insightful views of the valley and village. • Backpack with sturdy straps and supporting frame. • Clothing: Pairs of track/trek pants (quick-dry kinds). Alternatively, cotton pants with numerous big and small pockets can also be opted. T-shirts with collar (full sleeves is preferable), full sleeves sweater, full sleeves fleece jacket, full sleeve thick jacket, pair of thermal inners, pairs of sports socks and trekking shoes. To escape quick burst of rain, wind cheater or a light rain coat is advisable. Do not forget to carry synthetic glove (water proof), woolen hand gloves and sunglasses (avoid blue colored sunglass). • Essentials: Head scarf or sun cap, light towel, sun screen lotion (SPF 40+), cold cream, a leak proof tiffin box, coffee mug, a plate & spoon, water bottles (min 2), personal toilet kit and toilet paper. • First-Aid: Carry a first-aid box along. Make sure the box contains all important medicines that you require and some of the generic medicines to provide you aid during the trek. Some of the other important things to be included in the first-aid box are crepe bandage, band aid, gauze cloth, leucoplast, cotton, ORS, antiseptic cream, muscle-relaxing spray, and water purifying tablets. • Miscellaneous: Small repair kit including safety pins, strings, needle, and thread. Carry extra/spare batteries for your camera as there is no electricity available at the base camp or slopes. Also with LED torch carry extra sets of cells. To keep your things well-compartmentalized make sure you keep things in plastic bags. Also carry a few extra. Trekking pole is one of the mandatory trek gears that every individual has to carry along. For individuals who tend to experience loss of energy, it is advisable to carry dry fruit combinations as snacks. • Documents: It is important to carry documents such as an identification card, a medical certificate (specifying any chronic disease, any drug allergies, overall physical fitness, Blood pressure, blood group, and are you under medication of any kind), and disclaimer certificate.